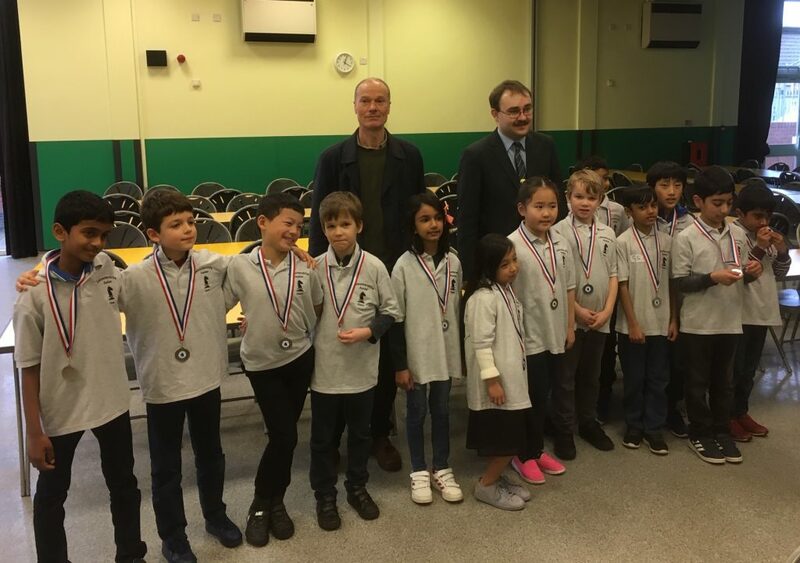 Leicester Junior Chess Club’s March mini-rapidplay took place at Holywell Primary School, Loughborough on Sat 30th and a record 48 children took part with a roughly even split between Leicester Junior Chess Club and Holywell Primary School Chess Club players. In the Kings sections, Henry Powell and Lindsay Pyun both scored 3 out of 4 points. Similarly in the Rooks section Aarav Sinha and John Leay also shared a perfect record with 4 wins out of 4. In the Knights section, Rohit Sreenivas (Holywell) tied with Lexi Abraham (LJCC) on 3.5 pts. A full strength Leicestershire U9 team travelled to Liverpool on Sat 16th March and qualified for the National Final in some style finishing just 1 pt behind last year’s national U9 medallists Warwickshire. Leicestershire got off to a flying start in round 1 recording 9 wins and 2 draws from 12 boards to lead by half a point from Warks and Notts. The second round went a little less well but still resulted in 8 wins to keep Leics 1/2 a point ahead of Notts but ominously Warks scored an impressive 11 points go 2.5 pts in front of Leics. At this point with the top 3 teams more than 6 points ahead of the 4th placed team, it was clear Leicestershire would win medals but of what colour? Round 3 started badly with a couple of quick losses but thereafter, win followed win until the team had netted another 10 points from the 12 games. As in round 1 Leicestershire had outscored all their other rivals, but in the final overall scores fell just one point short of Warks in 1st place with Notts 2 points back in 3rd place. Five Leicestershire players (Joshua Tang, Olivia Chen, Arooj Mahajan, Catherine Lv and Arav Ajaykumar) scored an impressive 3 wins out of 3 and it’s interesting to note the contribution of the 3 girls in the team (Olivia, Catherine and Sophie Mehta) who had not played in the U9s in the Midland Team champs (where the U9s finished 3rd) due to being on U11 Girls team duty that day who scored a massive 8.5/9pts between them. That said, this was above all a team performance where everyone played their part and was only made possible by multiple wins almost across the board. The full team was: Kajus Mikalajunas, Joshua Tang, Olivia Chen, Sophie Mehta, Arooj Mahajan, Madhav Eradi, Alex Shen, Catherine Lv, Arav Ajaykumar, Martino Cresciani Lombardo, Rishik Madhadi, Adeeb Syed, Oliver Brown. An U11, U11 Girls Team and U9 team competed at the Midland Team Championships at Notts High School on Saturday 9th February. The most impressive performance came from the U9 team, who despite being short of three team members who were playing for the U11 Girls Team, scored 14.5 out of 24 from the 3 rounds to come a close 3rd to the winners Warwickshire (16.5pts) and the runner’s up Notts (15.5pts). Kajus Mikalajunas, who recently scored 5/5 to win the Kenilworth Junior Open U11 Section and 5.5/6 to win the Minor U11o section of the Notts Rapidplay, won all 3 games on top board with ease. Alex Shen and Arav Ajayjumar also had a perfect 3/3 record whilst Madhav Eradi recorded 2 wins. As already mentioned, 3 of the U11 Girls team were U9, but the team battled well to tie for 3rd place with Northants on 5.5 (out of 12). Olivia Chen was unbeaten on top board with 2 wins and a draw, whilst Sophie Mehta scored 2 wins on 2nd board. The entire Leicestershire U11 team was in fact U10 and found the competition a tough one finishing 4th out of the 5 teams with 7.5 pts. Lindsay Pyun had an excellent competition on top board however scoring 2/3 as did Morris Walker on board 7. The Leicester Junior Congress took place on Sunday 13th January at Leicester Grammar School. 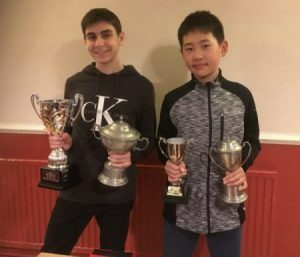 In the Open section Sasha Kerbel & Jason Lv, Leicestershire Chess’s’Most Improved Junior’ and ‘Junior Team Player of the Year’ last year, underlined their progression by winning gold medals tying on 5 points (out of 6) each. 8 year old Kajus Mikalajunas also had an excellent competition in winning a bronze medal with 3.5 points. There were 35 players in a competitive Major (U80) section. Leonard Wylie topped the list with 5.5pts and along with Zain Amir (5pts) and Leicestershire’s Joshua Tang (5pts) won gold medals. Leicestershire Juniors Kori Lee & Henry Powell both won silver medals with 4pts and Noor Datoo, Alan Skaria won bronze with 3.5pts. In the Minor section, the 3 gold medallists on 5 points (Catharine Lv, Josh Crook and Arav Ajaykumar) were all Leicestershire Juniors, with Adeeb Syed winning silver (4pts) and Varad Dahi a bronze with 3.5pts. Over 30 Leicestershire juniors played in the Four Counties Invitational Match for U18, U11, U11 Girls and U9s against Warwickshire, Oxfordshire & Northamptonshire that took place at Kenilworth School on Sunday 2nd December. The U9 team was the most successful of the Leicestershire teams finishing 2nd in the competition with wins against both Oxfordshire & Warwickshire Yellow (Warkwickshire fielded 2 U9 teams) before going down 5.5-2.5 to Warwickshire Red in the last round. Individually Joshua Tang achieved 3 straight wins on board 2 with Madhav Eradi (board 5) also unbeaten with 2.5pts. Arooj Mahajan, Alex Shen & Martino Lombardo (on his county debut) all won 2 out of the 3 games. The U11 team (comprising mostly year 5s) faced fierce competition losing in the first two rounds against Oxfordshire & Warwickshire but did well to draw with Northants in the last round. Aarav Sinha did well to score two wins. It was a similar story for the U11 Girls (3 of whom are under 9) who similarly lost to Oxfordshire & Warwickshire in the first two rounds but finished well with a 3-1 win against Northants. Catharine Lv had an excellent competition with 3 wins. The U18 team was missing many key players and much of the team was only just out of the the U11 ranks but nevertheless had relatively close matches with Oxfordshire (2.5 – 5.5) & Northamptonshire (4-4) but found it tough going against a dominant Warwickshire (1-7). Recently invited national squad member Jason Lv (aged 12) impressively won all 3 games on board 4. Jason Lv won the Kings competition with 4 out of 4 with Henry Powell in 2nd on 3pts with Alan Sharia. Meanwhile Jason’s sister Catherine won the Knights section with 5 out of 5, with Josh Crook and Arav Ajaykumar in 2nd on 4pts. 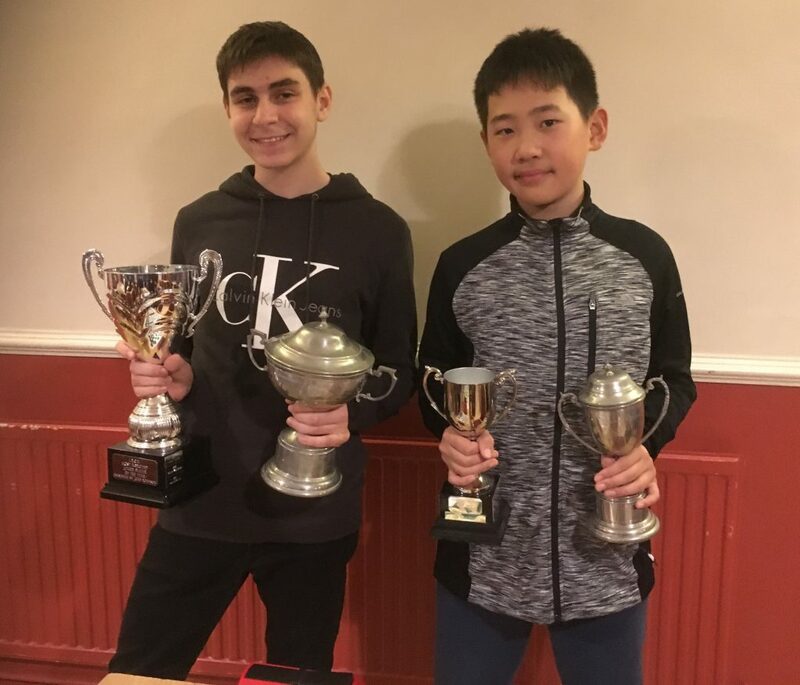 Sasha Kerbel and Jason Lv won the Most Improved Junior and Junior Team Player of the Year titles respectively at the recent Leicestershire & Rutland Chess Associations awards. Not only did they win these awards but Sasha also received the trophy for winning the County Major (U140) Championship and Jason the trophy for the County Minor (U120) Championship which they won in the 5 round competitions that take place over the summer. The following Leicestershire juniors played in the ultimate stage of the UK Schools Chess Challenge on September 15th/16th at Peterborough. To even reach this stage of the competition is a huge achievement and collectively they performed impressively with Kishan Modi’s 3rd= in the U14s the highlight. The 2nd Leicester HE Atkins Memorial Rapidplay will take place on Sunday 7th October 2018 at Leicester Grammar School. It’s an ECF graded 6 round Swiss rapidplay (20 mins + 10 sec) in Open, U165, U140, U115 and Junior U80/U40 sections. The Junior U40 section would be suitable for inexperienced players. In a combined Kings/Rooks section Adam Kerbel won the Kings (>ECF 45) with 4.5/5pts, whilst Aarav Sinha narrowly won the Rooks with 3/5pts on tiebreak from Alan Sharia. The Knights section was won by Arav Ajaykumar with 4.5/5pts.